How do we bring adequate preventative healthcare services to these communities and schools? Enter a 21st century solution: fully equipped mobile healthcare clinics from MST, led by our inspiring MD, Fernando Acafrao. These mobile clinics solve the issue of accessibility and high individual cost whilst maintaining the highest standard of preventative patient care by means of using technology. As recently as half a century ago healthcare practitioners had minimal IT solutions. Today, this is no longer the case. From the MRI’s for the identification of cancer to TMR for coronary artery disease, it’s clear that medical science has improved in leaps and bounds. Similarly, our mobile clinics are equipped with technology that is at the forefront of medical equipment today. 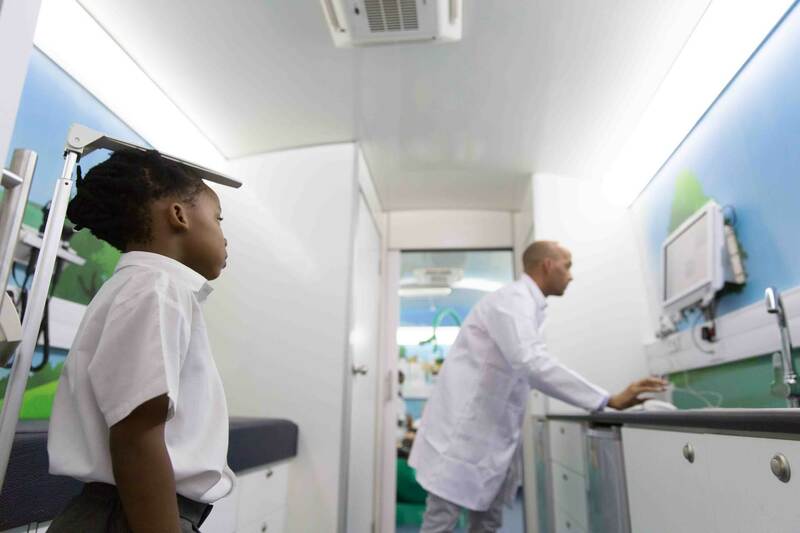 Mobile Schools Health units, which are in line with the Department of Health policy, generally consists of a 3-in -1 solution, encompassing: optometry, dentistry and primary healthcare. For example, the optometric room utilises fully automated machines which do a complete eye exam within 20 seconds, with minimal manipulation from the optometrist. The integration of technology reduces consultation time, allowing for more patients to be examined, improves accuracy by removing human error and ultimately ensures that the rural community and school children are able to receive medical treatment on the spot, rather than mere screenings.